I went to Back to Basics cooking school at The Cambridge School of Culinary Arts a few years back and blogged about it for Misstropolis.com. The website no longer exists so I’m reprinting them here. Enjoy! Chicken: versatile, economical, and satisfying. Trussed and stuffed, it can dress up for your finest Chardonnay. Breaded and fried, it can dress down for your cheapest beer. Whether it’s roasted, fricasseed, or grilled, this bird is perfect for any occasion. Chicken is a staple in my house. With a couple of picky eaters, it rarely fails. Our favorites include tenders simmered in Indian spices and Ina Garten’s lemon chicken breasts. Although I cook it regularly, and love every bite, I have never overcome my squeamishness handling it. Maybe it’s the texture. Or maybe it’s because it actually looks like a bird. Over the years, chickens quality and safety have come into question because of the production methods at many processing plants. According to an article in The New York Times in 2006, “The government said that 16.3 percent of all chickens were contaminated with salmonella.” I have read articles and cookbooks on the safe handling of chicken. I know to segregate, clean up, and never undercook. But my nervousness has led to less succulence and more dryness in many of my dishes. I enter Day Two of my “Back to Basics, part II” class at the Cambridge School of Culinary Arts looking for the answer to my chicken conundrum. How do I handle it safely and cook it to perfection? My instructor, Steve Nill, starts the class with the merits of buying a whole bird instead of pieces. “You are guaranteed better quality and value if you carve it yourselves,” he says. “Sometimes portions of the bird might be discarded because of disease but the rest is packaged.” He spares us the details but the bottom line is nothing can hide with a whole bird. With the pieces that you are not using, he suggests, freezing them on a cookie sheet. Once they are frozen, they will not stick together, and can be stored in a freezer bag. 1. Don’t undercook. 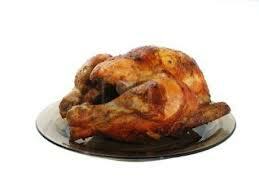 Salmonella is killed at 165 degrees. Stick meat thermometer in thickest part of thigh. Juices should run clear, not red or pink. It will continue to cook 5-10 degrees out of the oven. 2. Don’t overcook. It will be chewy and dry. Well, there’s not a lot of room for error here. Undercooked, you’re sick. Overcooked, you’re parched. Then our lesson moves on to the results of a recent chicken taste test at the school. Students tried Bell and Evans, Purdue, kosher, and a supermarket brand. Bell and Evans won. Kosher was second. Perdue and the supermarket brand tied for last. It turns out you really can judge a chicken by its color—if the color looks like your friend with the flu, don’t buy it. After our lesson, we gather in the test kitchen to learn how to cut a chicken. “The chicken basically has seams and tells you where to cut,” Steve says, as he eases his knife down one. He points out the pope’s nose and the oyster—two pieces in my 41 years of eating chicken I have never heard of. I fumble my way through the carving, burrow out the oysters and claw for the tenders. My hands feel slimy as I resist tucking my hair behind my ears. I wish I had opted for the gloves. With our freshly cut pieces we divvy up the recipes and I get the whole bird to roast and stuff. There is a two-stage process to roasting. The temperature should be high at the beginning, than lower it. This creates a crispy skin and an evenly cooked interior. Steve shows me how to truss my bird, which preserves the shape, keeps the stuffing in place and equalizes the internal temperature. Once my roast is in the oven I learn how to fry, barbecue on a stick, cook under a brick, and make roulade (rolled) chicken. My favorite time of class arrives and it is time to sit down and eat. We devour Indian spiced chicken with a yogurt raita, arugula salad with roulade of chicken stuffed with sundried tomatoes and goat cheese, my roast with cranberries, apples and walnuts stuffing served with a calvados cream, southwestern fried chicken, peppered chicken with hot and spicy ginger sauce and spicy stir-fried sesame chicken, green beans and shitake mushrooms with noodle cakes. As we are cradling our stomachs, Steve offers “le trou Normande”—a shot of calvados to aid our digestion. “Le trou” means hole in French. In the Normandy region of France it is customary to drink this apple liqueur in the middle of a meal to make room for more food. Which means, I get to go back for seconds. Hurray! Every dish is delicious and juicy. My chicken repertoire has expanded and my riddle has been solved. This entry was posted in Food, Local, Personal Essays. Bookmark the permalink.